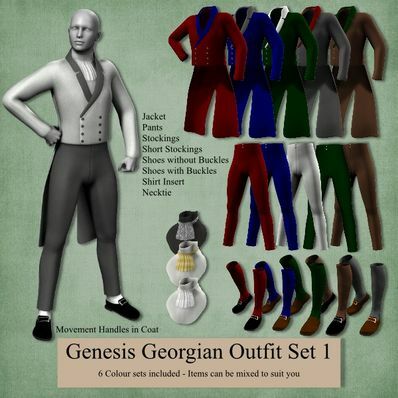 A Georgian Outfit for Genesis for use in Daz Studio 4. Several colour Textures to mix and match. To avoid Poke through on Pants, and Coat use the Short Stockings and Shirt without sleeves. Copy the data, People and Runtime files to your "/Documents/DAZ 3D/Studio/My Library" folder. very nice work on this. So much to study and look at. Just so happy to even look at all these wonderful creations. Many thanks for this beautiful clothes! All the best! Lots of happy campers in the DanniStories camp, thanks! Good grief, such attention to detail, just love it. Outstanding work, thank you so much for all of this.